The result of all mechanical experiments should be to add something to the science of demonstrative mechanics—whether an experiment is successful or otherwise, the result is in either case oi like importance to that class of thinking, investigating inventors, who often risk the bread of their mouths on the result of an experiment, which only can be definitely determined by a practical demonstration—which in many eases has been done by some one, who, if they had written out the result for some paper, showing the philosophical principles involved, would contribute much valuable aid to inventors, who would know til at through the medium of your useful paper they would find much valuable information. 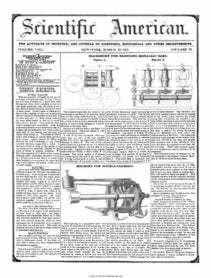 I find a patent has been granted to E. R. Hallam, for a reciprocating gas metre, what its particular advantages are does not appear from the claim. I have experimented on this kind ot metre as many others have, and found the result to be unsatisfactory, which, if the result had been written out and published by the first experimenter, showing the reason of its first failure, much time and money would have been saved to future inventors, who paid lor turning the stone, and found nothing. The general arrangements of metres of this kind are very much alike—a piston with induction and eduction valves. I found that with gas passing through the metre and pipes, about one-third the capacity of the pipes for discharge, a steady light could be obtained, as the small expansive force of the gas and instantaneous movement of the valves keeps up the equilibrium of piessure, but when more than this quantity was passed, tee lights were more unsteady, as the number of burners was increased; the apparent reason was, that the increased quantity discharged caused increased velocity in the pipes, giving to the gas a momentum that destroys its small expansive lorce, and makes a partial vacuity near to the eduction side of the metre, when the momentum of the gas on this side of the metre recoils to fill the space, making the lights faint. On the induction side of the metre, the shifting of the valve stops the current of gas for a small conceivable point of time, but sufficient to make an accumulation of force, similar to the hydraulic ram, which, when the valve opens, causes the lights to puff up higher than the ordinary pressure would make them—when a long induction pipe is used the trouble is increased. Now this is a difficulty to which all reciprocating metres are subject—the present rotary drum metre is the only practical plan. D. H. New Haven, March 1853. The Indianola Bulletin, in speaking of the mfnera products ot Texas, says :—The white marble extending from Austin to San Antonio along the mountain slope, is inexhaustible—indeed there are whole mountains of it, of the most beautiful kind, which is quarried, then sawed as wood into any desirable shape, and planed off to a perfect polish. It is quite a soft rock when taken out, but hardens immediately by exposure to the air.